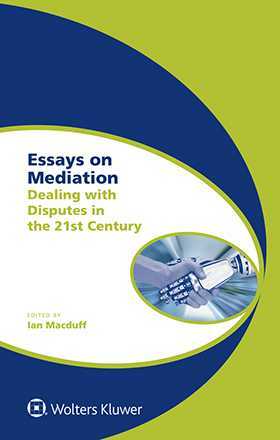 Essays on Mediation explores the practical uses of mediation and contemplates the power of both the oldest and the newest form of dispute resolution. Across a range of jurisdictions, in differing legal systems, mediation is achieving ever greater institutional and statutory force, and what not long ago was a marginal technique for dispute resolution is now becoming mainstream and orthodox (with the arrival, for example, of the International Mediation Institute as a standards body). Nevertheless how firm a sense do we have about the social formation we call ‘mediation’? Through reflections and case histories, this distinctive collection of essays by experienced mediators from across the globe provides a clearer understanding than we have had heretofore of what mediation is and what it can offer as a practical, accessible, and positive alternative in civil justice systems. This book further elaborates on how mediation developed in different contexts and how it works in intercultural settings, as well as in intense and international conflicts. The role of mediation and mediators in assisting wider collaborative dialogue for civil justice challenges is discussed. The questions raised, such as identifying unmet needs, improving the provision of services, fostering an ongoing conversation on mediation and access to justice, go well beyond the confines of commercial dispute resolution and the walls of courtrooms. Through the practical experiences described by key practitioners and authors from a range of jurisdictions, this book aims to bring about a moment of both a professional and a philosophical reflection on the state of mediation. The useful and insightful perspectives of diverse fields of application and practice of mediation enable practitioners to become thoroughly conversant with the current state and contemporary relevance of mediation. This recognition of deep roots and contemporary relevance of mediation outlines the promise and potential of the powerful resources that mediation and mediators can bring to the table; this book will be a welcome addition to this topic by legal practitioners and jurists, as well as academics.